The challenge at Shopping Our Stash this week is perfect for me. #160 is Can’t Put it Down (or away). I’ve been alternating between making cards using the Tim Holtz 12 Months of Tags June technique or using my new Scripty Thanks die from Lawn Fawn. 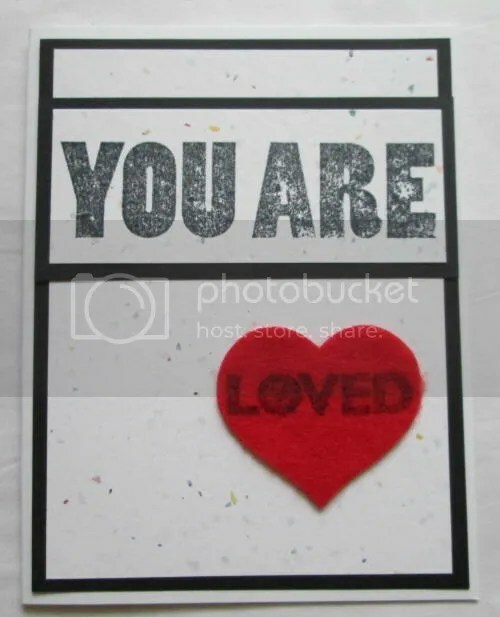 Today’s card uses the reverse stenciling technique by Mr. Holtz. I love that this ends up like you’re in a forest, looking up at the trees. GP white, Bazzill Brown. Tim Holtz Rays Stencil. 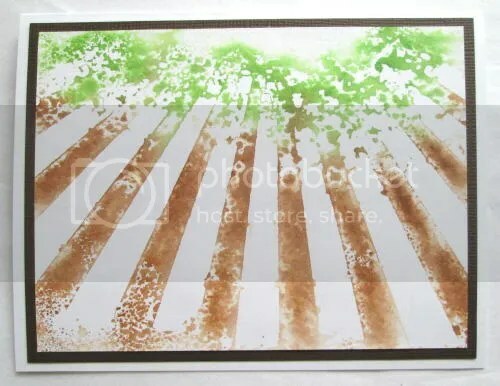 Distress Inks in Vintage Photo and Mowed Lawn. The Challenge this week at Shopping Our Stash is #158 – Red White & Blue. GP White, Recollections Blue & brads, We R Red White & Blue – Freedom Stripes. TPC Studio Hugs and Kisses in Distress Inks Faded Jeans. The challenge this week at Shopping Our Stash is #157 – Color My World – use your favorite color. This is my second card. My favorite color is black which pairs really well with my favorite color combo which is rainbow. 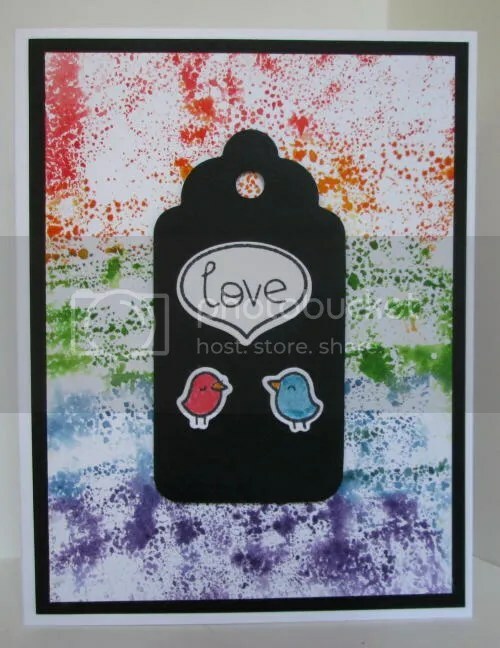 I also used a Tim Holtz stencil & the technique that he used in his 12 Months of Tags – June post. GP White, Recollections Black & brads, Xerox Flecs Cover, Distress Inks in Barn Door, Mowed Lawn, Faded Jeans, Peacock Feathers & Dusty Concord. 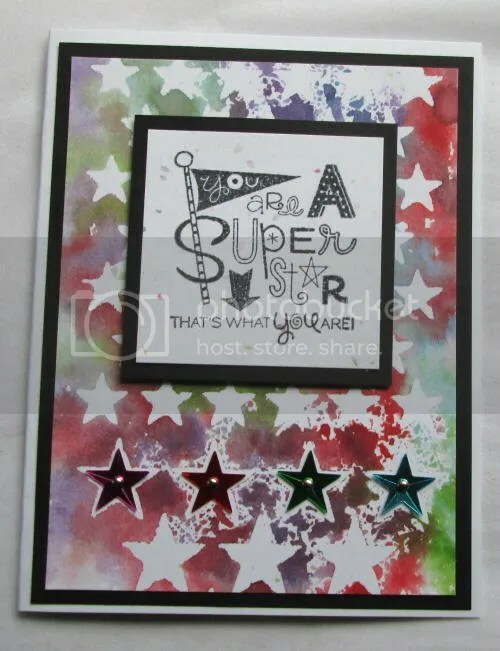 Tim Holtz Stars Stencil THS001. Studio G in Memento Tuxedo Black Ink. The Precious. No ID sequins. The challenge this week at Shopping Our Stash is #157 – Color My World – use your favorite color. 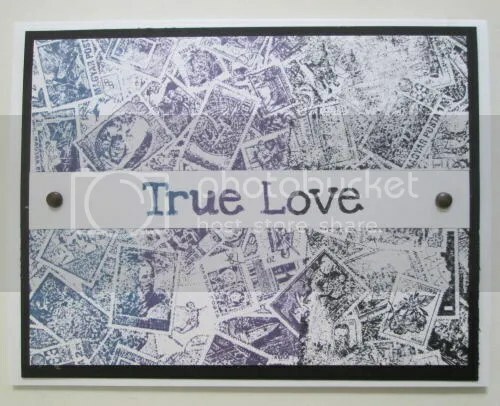 Along with the Lawn Fawn sets that I bought this weekend, I also bought some Tim Holtz stencils. I realized I had everything I needed to to try the technique that Tim used on his 12 Months of Tags – June. Well, everything but a water spritzer, but then I remembered the “sea salt texturizing spray” that I received in one of those “get a box of random stuff every month” things that I won a subscription to. I ran upstairs, dumped the spray, rinsed it out, got the spritzer clean et voila, a lovely no cost to me water spritzer. Here’s the result. You can’t tell from the picture but the tag is popped with dimensional adhesive. GP White, Recollections Black, Distress Ink in Barn Door, Marmalade, Mowed Lawn, Faded jeans & Dusty Concord. 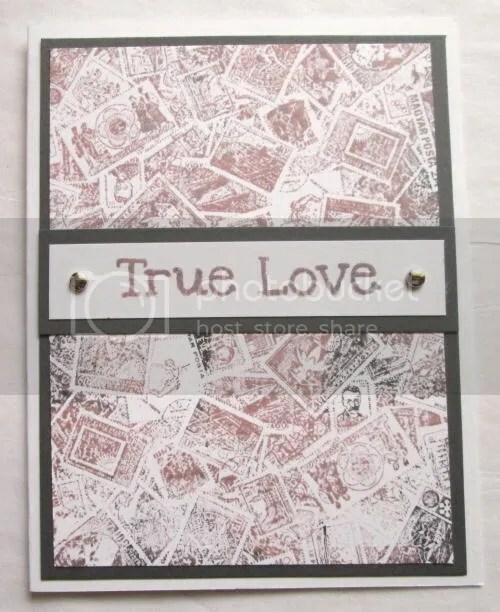 Tim Holtz Speckles Stencil THS021. Distress markers in Salty Ocean & Worn Lipstick. Memento Tuxedo Black Ink. The Precious. 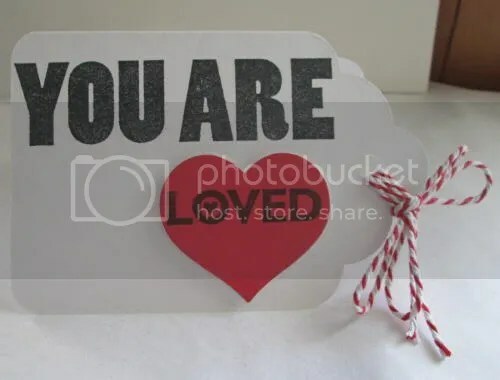 Sizzix Tag Die. Lawn Fawn Chit Chat Dies & Stamps. The challenge at Shopping Our Stash is #156 – Use your Oldest Punch or Die. One of the first dies I bought way back when I bought my first Sizzix was the Large Classic Scallop Tag. I have a thing for tags and bought every tag die Sizzix had. 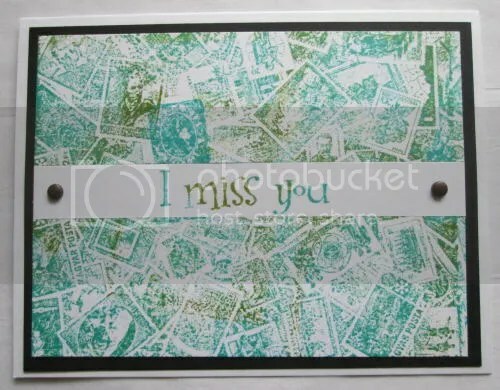 Never mind the fact that I did no kind of paper crafting at the time… This is my favorite and my most used big die. GP white, Colorbok red, Momenta stamps in Momento Tuxedo Black. Pick Your Plum Baker’s twine. The Precious. The Midweek Challenge this week at Operation Write Home is a Color Challenge – Pink and Grey or Black. 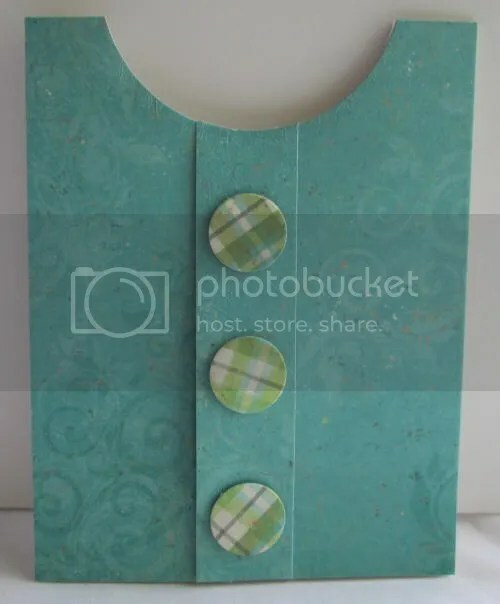 I made this work with the Shopping Our Stash Challenge as well – #153 Background Check – create your own stamped background. Crestwood – Metallic Cover – Gun Metal, GP White No ID postage rubber stamp + TPC Hugs & Kisses in Distress Inks Black Soot and Victorian Velvet. Recollections Brads. 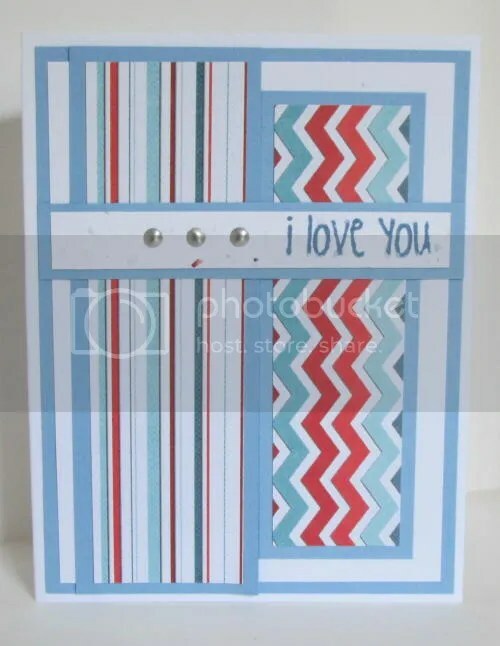 The challenge this week at Shopping Our Stash is #153 – Background Check – create a stamped background. I used a no ID vintage style postage rubber stamp. This is a variation of the card that I submitted yesterday. Recollections Black & brads, GP white, No ID stamp + TPC Whimsy Greetings sentiment in Distress Inks Peacock Feathers and Peeled Paint. I used a no ID vintage style postage rubber stamp. Recollections Black & Brads, GP white, No ID stamp + TPC Hugs and Kisses sentiment in Distress Inks Faded Jeans, Dusty Concord and Black Soot. Today the stars aligned and two similar challenges presented themselves to me. First Shopping Our Stash has the #152 Birthday or Anniversary challenge this week to celebrate their third anniversary. 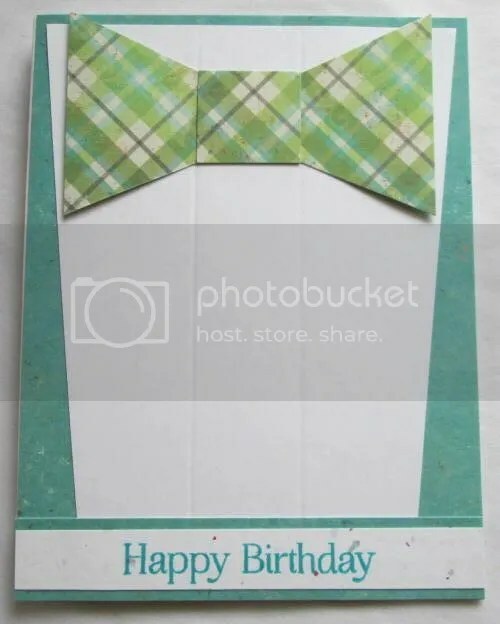 Second, The Midweek Challenge at Operation Write Home is to make a masculine and feminine birthday card. Et Voila. The cards are not the same layout but are very definitely masculine and feminine. 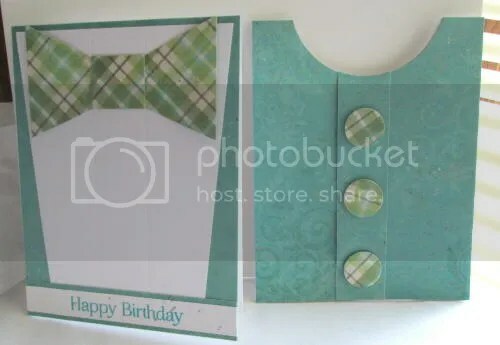 This card is based on the OWH Tuxedo Tutorial. I love giving the card a more casual look. This is my version of the OWH Sweater Tutorial. 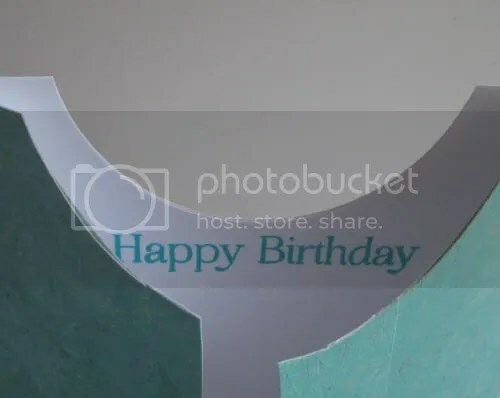 It says Happy Birthday inside. GP White, Xerox Flecs Cover, We R Storytime – Gretel. Hero Arts OWH Hot Air Balloon Birthday set in Peacock Feathers. The Precious.